ShareTimetable.com is a free appointment and resource scheduling tool design for easy use, with simple and user friendly interface. ShareTimetable.com is a booking system for any common resource used by multiple users: The neighborhood tennis court, the family summer house, the workplace’s conference rooms, the company’s vehicle, the school’s auditorium, projectors, lab equipment, or any other type of resource that require common scheduling. Additional usage of this tool is an appointment scheduling system for small business like hairstyle salon or massage clinic. ShareTimetable.com can also use as a simple appointment booking system for businesses and organizations. With our simple API, Booking can be easily integrated into your site and peoples can schedule appointment with staff right on your site. See example with our demo WordPress plugin. Our free booking system can be used for businesses, for university staff and for communally used resources. Hourly or daily display timetable. Assign privileges: Viewer, User and Manager. Publicly open for non-registered users. Simple to use, easy to manage. Mobile view, designed for smart-phone clients. The system is design as multiple user environments. Any user can create a new Timetable and manage it. A Timetable can contain multiple resources and time intervals. For example: a Timetable can include the company’s conference rooms (CR1, CR2 and board room) from 9am to 6pm in 30 minutes intervals. Users can book rooms at these times for 30 minutes, 1 hour, 1.5 hours, 2 hours and so on. Every Timetable has a unique public identifier. Users that know that public identifier can join the Timetable and be able to make bookings for the common resources, in the example above: a user can book CR1 for two hours starting at 11 am. Once a user made a booking the time slot will show in the Timetable as taken. 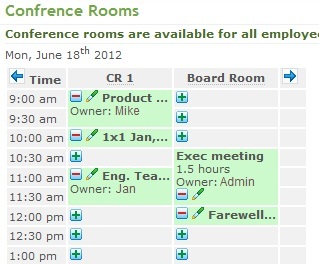 The timetable manager can assign roles to users: Viewer can only observes the Timetable, User can make bookings and Manager can also edit and delete other users’ bookings. Timetable can be set as Private for registered users only, Public for unregistered users to view existing bookings or as Open for unregistered users to make and manage bookings. Returning to the above example, the Timetable manager shall invite the company staff to join the conference rooms Timetable by sending invitations with the Timetable’s public ID, thereby allowing staff members to observe the rooms’ availability and book rooms for meetings.